Okay my turn to ask a question now. 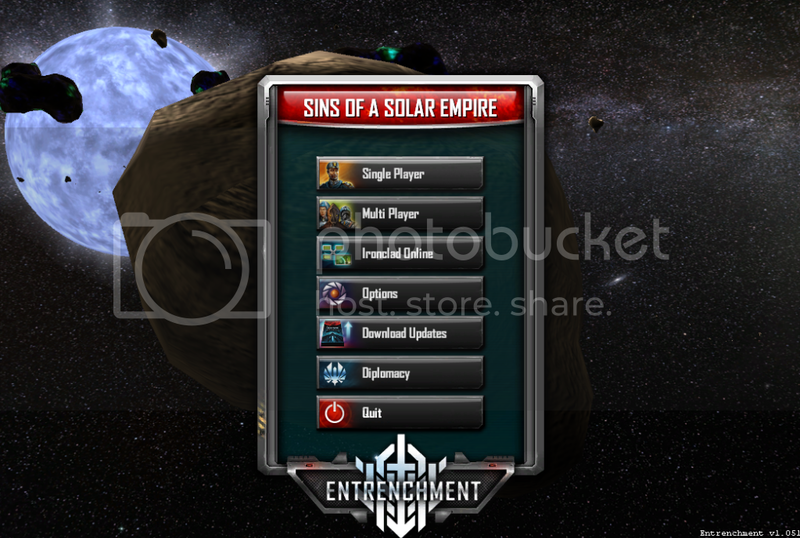 Does anyone know what map the game uses to create the little solar system in the background before you launch a game? If we could determine which one it was (assuming its with the rest) we could create some awesome background battle scenes such in Empire at War. The backdrop is randomly generated each time... This means that it either draws upon one of the Random maps or has some sort of internal map generator. I got a question as well. 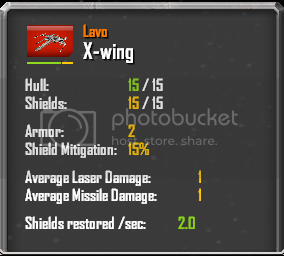 Say I have a laser weapon that has a Damage value of 100 (same for all Banks) and the weapon has a burstCount of 2, this weapon would do 200 damage per volley (aka. 100 damage/shot), correct? Also, on Entity modifiers, there's modifiers such as ShieldPointRestoreRate and MaxHullPoints, and I was wondering if there's any sort of Shield Point modifer, like MaxHullPoints, out there? and the weapon has a burstCount of 2, this weapon would do 200 damage per volley (aka. 100 damage/shot), correct? No. Burst count is purely cosmetic, the game does not associate damage values with individual shots. All it is used for is spawning multiple lasers/missiles etc. with each volley. Look at the Advent hangar shield bestowal ability. If its possible you'll find it there. Hrm. Thanks, I have some changes to do then. Indeed it exists; called MaxShieldPoints no less, thanks. For reference, I'm using this in an attempt to give fighters shields, via ability, will post if it works out. Edit: And it seems it works, I think. Will see if the shielding works properly however. Holy $%!#, that's awesome. I guess it just got so ingrained in people's heads that fighters can't have shields that no one bothered to try. If it works and I've got some new features to add to my mods. I think I might have stumbled across something referring to this in the diplomacy.user file. But, I think that would be either to generate or not to generate a system instead of pick and choose what you want there. You could use that as an angle to look into it maybe. Okay guys, my turn for some help. I am trying to develop a method through an ability/buff setting using the Fleet Beacon concept that when a ship dies another ship is called in. I got it "stable" but it doesn't call in a ship when it dies. This is the coding I have. This works for me as a passive ability. Edit - De nada... Let me know if it works for you. Thanks, I will give it all a try. Are you spawning a capital ship or a frigate. It works well with a capital ship because fleet supplies are ignored. If you are spawning a frigate are your min/max supplies right? The frigate is only at 1 supply and I am a 75 supply available. I almost get that feel that it happens to slow. Will remove any delay and see if that helps. I forgot to put in a point for it. That explains why it didn't work. I see...so it was your fault. Yeah I was used to my settings which was set to fixedlevel0 setting. I just copy/pasted ZombieRus5's and didn't see that change up to intrinsic setting. But I fixed it and it works great. If I had read, I'd have seen. levelSourceType... Intrinsic is only for leveling capital ships. Setting it to FixedLevel0 allows the ability to be used without any pre-requisites. I've asked this before and I got two contradictory answers from two different people. If I make a basic capital ship hull, I know I can use the same mesh and just provide different textures if I wanted a "generic" ship. Can I use the generic mesh/hull for all ships and allow each ship to have a unique mesh model for a superstructure? The idea is to use a single model for the main part. It is easier to make multiple models use the same texture sheet. than to use multiple textures, and one mesh to represent different units. The requiem mod, and SotGE ships share many textures. A Sins mesh cannot "switch" textures through scripting (afaik). How sins is set up now each unit is represented by a separate mesh with a separate texture for each mesh. Tec, Pirates, and planetary defenders pretty much share the same meshes, and resources. However Pirate meshes share some textures with each other. This is something you may be interested in checking out. As far as making a single hull mesh, and having mesh add ons called for to represent different units.. Aint gonna happen. If you look at the starbase, and structure upgrade meshes, each upgrade mesh is the whole structure with the add on that represents each upgrade added to the mesh. So tech, advent, and vasari starbases have 3 meshes of the whole starbase the only difference is the add ons. It is kind of stupid imo how they did it, but i didnt build the game. Homeworld 2 does the same thing with some units with its module upgrades. If it was possible to have small module upgrade meshes added to a single main hull it would save so much in system resources. Well that answers the question. Simple enough. I'm looking down the road at making a Minimal Sins with the same models for all sides just using the textures to differentiate them and dumbing down the models. Maybe I'll sit down this summer and really try to dig into it. Thanks for the reply. Not a question, but I recall awhile ago one or more people were wondering if it is possible to play with the backdrop that shows up when the game boots up. I'm pleased to say that this is possible, and that I have done so. The scene generator or whatever it's called uses the Random, WeightedRandom, and RandomStar (groups from GalaxyScenarioDef) to generate the backdrop. An example with a blue star and only asteroids for planets. Hmm, interesting. Do you know if it uses a specific map to pick those groups? Because I really can't apply custom templates to random worlds without changing the template for every individual planet in those groups. I suppose I could just make copies of the original weighted random/random and change every map to use those, then make some new planets with the desired default template to put under WeightedRandom/Random, so thanks for the info.